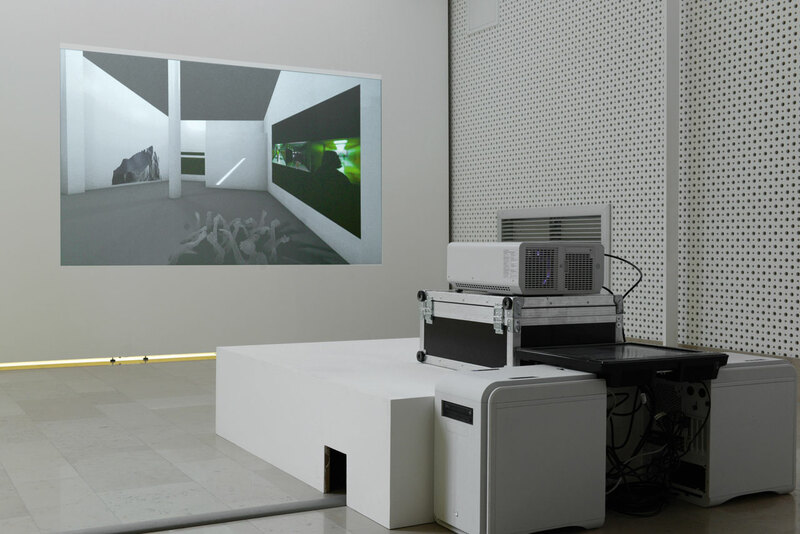 Video-projection, screen, network installation, website and program, size and support variable, 2013. If he doesn’t already know it, I recommend Hans Belting’s book Florence et Bagdad, une histoire du regard entre l’Orient et l’Occident. [Florence and Baghdad: Renaissance Art and Arab Scienc] to Nicolas Lebrun. But he surely knows this book published two years ago by Gallimard [2011 for the English edition] and I don’t doubt that he has also studied the publication by the same Hans Belting L’Histoire de l’art est-elle finie ? [The End of the History of Art?] because it is a question that concerns him visually. Belting’s book was published in 1989 [1987 for the English edition] at a time when performances and installations threatened the visual arts with fatal implosion. Belting suggested that, the idea having swept away history and since a new meaning had been given to it, art could do without a narrative. It was in a way immobilised. The Internet was going to immaterialize it. This “Copernician Revolution”, if it does not rekindle the lost history of art, does bring us back to Blaise Pascal who, jealous of the wonders created by the painters of perspective, invoked for the moral the same search for the point that, like the vanishing point, would be the place of truth from which to think of things. Four centuries later, is art the point of truth of the canvas? Let’s face it, Nicolas Lebrun has not come to Montrouge to show his works but to think them, and to make us think them, and make us think of the works of others, who surround him, precede him, dominate him, and question him, or not, on essential issues: How “to make” art, and how to exhibit it at a time when all creation is simultaneously uploaded, printed in 3D, circulated infinitely, enhanced by numbers of views whose record is the heart. Here, the artist welcomes being dispossessed of his work which he sees changing its nature to suit the cybernetic orthodoxy. A veritable IT sponge, Nicolas Lebrun’s project questions the circulation of works, their place here, it would be sadly useful if he had come out of his liquid element: the exhibition, its context, what you are doing in wondering what are those screens, those random projections, that are moreover very elegant, almost design, giving the eye a comfort, a geometry, in short he means you no harm. Organizer of a virtual party, he sends his thinking immaterialities to search engines that cannot, but. Certainly, he defeats curators and collectors because his proposition, as soon as it’s clicked, is collected by all the dumbfounded internet users. But his system has the great, paradoxical merit, of placing the visitors to the Salon de Montrouge outside the canvas, as lost rebels. Just like the painting from beside is in the history of art a point like another, the virtual organization that Nicolas Lebrun is trying to introduce in your mind is another point “like another” of this history. But a point that inevitably changes the perception of it. He threatens, he cruises, he implores, and even if you refuse him: “I don’t understand anything about it”, you cannot hurt him at all.